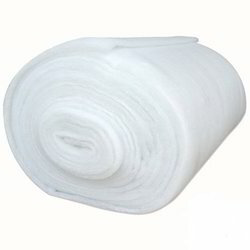 Backed by the quality devoted approach, we are serving huge expectations of our clients by providing the best quality Poly Wadding Polyfill to our customers. Fiber Polyfill is made with the use of hollow conjugate Fiber . We get more loft in less GSM with the use of Hollow Conjugate Fiber . 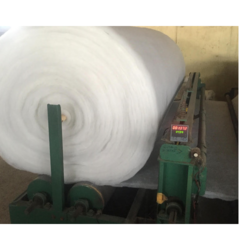 We use 1.5D, 3D, 6D, 7D, 12D 15D Polyester Fiber for making polyfill in various finishes. Extra Silky Wadding is available in all gsm. Size 40" to 120 "
Soft and warmth,High loft,Eco-friendly,Mildew resistant,Non allergenic, Washable, Not be yellow, Light weight,Breathable,Easy to clean and etc. Garment batting,Sleeping bag,Glove,Cushion Sofa Pad,Mattress Pad,Car seat pad,Building,Deck furniture,camping,Boating and RV accessories,Futons,Upholstery, Airplane,Train,Car pad,Medical area and so on. 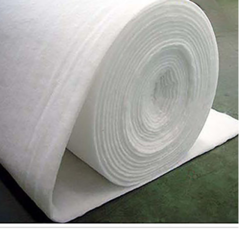 We use 1.5D, 3D, 6D, 7D, 12D 15D Polyester Fibre for making polyfill in various finishes. 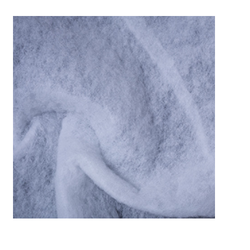 Our fire retardant wadding or padding is made from 100% flame retardant First Grade Polyester Fibre without addictive. 1. 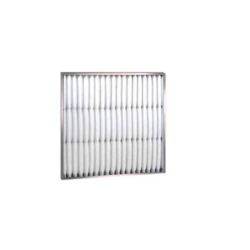 Completely complies with American flammability standard 16 CFR 1633,BS 5852-III. 2. Fire-retardant batting has no chemical flame retardant additives and certified with ROHS by SGS. 3. Fire-retardant batting has permanent flame retardant feature, little nontoxic smoke and no drops when burning. 4. Fire-Retardant Batting can keep its shape after burning. Chemical Bonded PolyFill is essentially used in garments and home-furnishing products to protect the shell fabric of the product, to enhance its aesthetic appeal, insulation and to provide comfort. It is produced with use of Chemical Eco-Friendly Binders which give high loft and bouncy feel to the wadding. Mechanically Bonded (Needled Wadding) to let our customers choose the best as per their requirements. Width upto 126 inches or 325 Cm. Wadding from Low Deniers or Micro Fibre, Fire Retardant Wadding, Heat Sealed Wadding, etc are also available. Packaging Details Vacuum Packing Available. We also Supply Non Vacuumed Polyfill. Made from fine fibers 1.5D-3D it gives the product lot of softness and comfort feel to the product. Micro Poly fill is a niche market product. Used mainly in high end upmarket home furnishing products like bed spreads, quilts, etc. Made from fine fibers 0.9D-3D it gives the product lot of softness and comfort feel to the product.Other area of applications our hotel quilts, baby bedding products, expensive outer wears, etc. Thermo-Bonded Poly Fill is essentially used in garments and home-furnishing products to protect the shell fabric of the product, to enhance its aesthetic appeal, insulation and to provide comfort. It is produced with blending Low Melt Fibres with PET Fibers. Fire Retardant and Washability gives Thermo bonded Polyfill an edge over regular Spray Bonded or Chemical Bonded Polywadding. We are offering Compressed Wadding made from Thermobonded Fibres and Other Fibres in compresed and high density. 1. Insulation - Acoustic and Thermal. 3. Furniture like Chair, Sofas Bed. These wadding have very high density and sponge like characteristics. 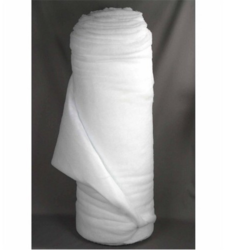 We are not only the largest manufacturer of Polyfill in India but we are manufacturer of most kinds of polyfill under one roof. 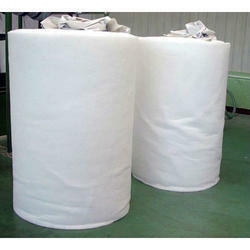 We have 3 Top Class production lines which makes variety of polyfill. 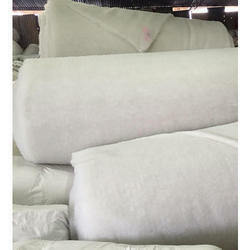 We use raw material which are OEKO TEX tested and can supply wadding which are APEO Test passed. We have certificates available on request. 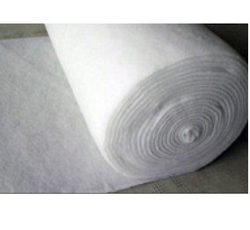 Polyfill Sheet is available from 30Gsm to 1000 Gsm, upto width of 325 cms and length upto 100 meters. 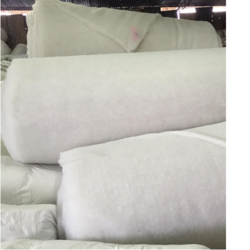 We make almost all Finishes like high loft, Siliconised, Conjugate, Hollow Virgin Polyester Fibre, Flame Retardant, Micro Fibre, etc.